Committer Jitters Aren’t Too Bad! Earth still seems to be rotating, so that’s encouraging! experience, adopting ports and submitting problem reports. first port, feel free to contact me! Intertubes will continue to function correctly! hope to assist in that effort. support that brought me here! Two separate base systems are available – one for VMware Server 1.0 and one for VMware Player 1.0. Why these products use a slightly different VMX file format is beyond me! I plan to use this vanilla VM as the base for future VM downloads, and by breaking /usr/src and /usr/ports into separate downloads, that will keep the overall size down. All downloads are available from BitTorrent, and please consider seeding the files if you find them useful! I just got a message on the FreeBSD-hackers mailing list about a new mailing list where “works in progress” will be detailed: FreeBSD-wip-status. By subscribing to this mailing list, you will keep up with the cutting edge of FreeBSD development and learn about the many ways that FreeBSD is used out in the world. know who’s interested in FreeBSD. Post this on your blog! provide periodical status reports about ongoing FreeBSD related WIPs. should receive status reports from now on. I recently learned of the ElasticDrive application that implements a disk device backed by Amazon S3 and other kinds of storage services. 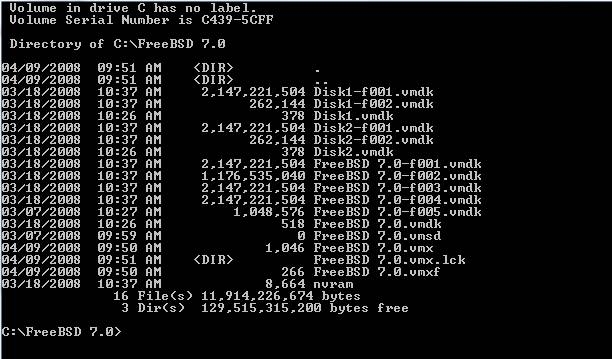 To determine whether I could easily deploy an infinitely-scalable disk device on my FreeBSD servers, I downloaded ElasticDrive and proceeded to install it on a FreeBSD 7.0 virtual machine. There are a few prerequisites, such as FUSE and Python setuptools, but those are easily installed with the FreeBSD ports system. If I can get ElasticDrive to work, it will be handy to package it as a port for one-command installation. drwxr-xr-x  2 root  wheel          0 Dec 31  1969 .
drwxr-xr-x  4 root  wheel        512 May  7 13:36 .. Cool – this looks promising! using 4 cylinder groups of 25.00MB, 1600 blks, 3200 inodes. Woops – what’s this now?! Looking at the newfs source code, this error is generated when data read back from the disk doesn’t match data written to the disk. I’ve tried to figure out what the problem is using truss and other techniques, and I’ve contacted ElasticDrive to see if they have any ideas. So far, nothing has worked. If anyone else has an idea how to troubleshoot this, let me know. Who’s Going To BSDCan 2008? I just registered for the BSDCan 2008 conference in Ottawa, ON, Canada on 5/16 and 5/17. I’m really looking forward to meeting some of the folks that I’ve exchanged emails with over the past couple of years while learning and using FreeBSD and maintaining some ports. Is anyone reading this post going to be at the conference, too? If you want to meet up, drop me a line and let me know. I hope to leave the conference with a lot of new FreeBSD knowledge and hear about how others use it and what to expect in future versions. I’m also just looking forward to getting back to Ottawa. We’ve mostly visited there in the winter for the Winterlude and cross-country skiing at Parc Gatineau. If you enjoy freezing your tail off in mid-February (-30F at night not unheard of!) and skating on the Rideau Canal with 50,000 other fun-loving souls, you’ve got to visit! I imagine that the warmer months will be very nice as well, and I do hope to see some of the Tulip Festival while I’m there. I tried to debug the problem from here since I don’t have Vista installed anywhere, but nothing has worked yet. He sees the same problem with VMware Player, too, so I wonder if it’s something to do with Vista permissions or some other security setting. If someone has an idea what the problem could be, let me know.